Orlando Honors Pulse Victims With Rainbow Crosswalk - Joe.My.God. The work finished on National Coming Out Day. 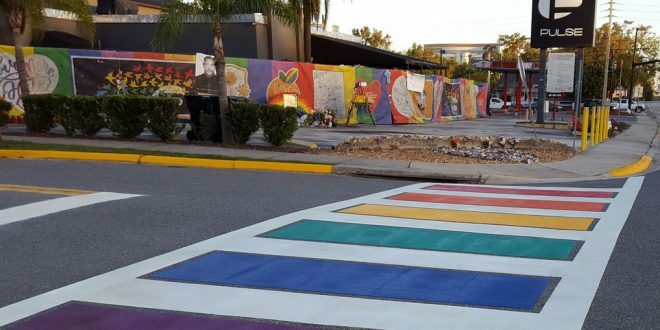 A crosswalk to honor the Pulse nightclub victims was completed early Wednesday by the city of Orlando. A petition on change.org for the installation of the sidewalk was signed by more than 2,000 people to pledge their support to honor the men and women who lost their lives at Pulse on June 12, 2016. On Monday, the OnePULSE Foundation hosted the first Pulse memorial town hall at the Orlando Repertory Theater to discuss plans for permanent a Pulse memorial. Also on Monday, the Orlando City Council approved the foundation’s permit request to install a new fence, benches and other improvement around the nightclub building.